As Carla struggles to come to terms with the aftermath and bereavement of different kinds, and Ben faces the consequences in prison, their stories will be forever entwined. 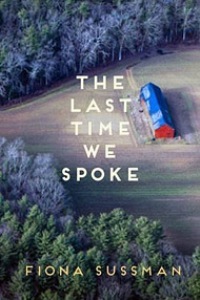 New Zealand author Fiona Sussman has created something absolutely remarkable in her blended crime and contemporary fiction novel THE LAST TIME WE SPOKE. Winner of the 2017 Ngaio Marsh Award (link is external) for Best Crime Novel this is a novel that contrasts the brutality and thoughtlessness of a crime, against the heartbreaking loss resulting, and the way that a woman recovers, and rebuilds her life in the aftermath. It's a story that's all too familiar. An illiterate disadvantaged young boy, caught up in gang life, gets involved in a brutal, vicious home invasion that leaves one person dead, another seriously injured never to recover, and a woman struggling with that reality, to say nothing of what they did to her on the night. That woman, a farmer's wife had led a normal life involving family and the farm, nothing in her past could possibly have prepared her for the way that one violent act would tear her world apart. And then there is the problem of how she moves on. This woman loses everything that is near and dear to her on that night, and when the media attention has faded, when the perpetrators are identified and jailed, there's still the problem of why and what does she do with a life that's ripped to shreds. Sussman has created an astounding exploration of consequences in THE LAST TIME WE SPOKE. What Carla Reid does with the pieces of her life is confronting, distressing in places, hopeful and profoundly uplifting in others. What causes a young offender like Ben Toroa to do what he did is considered, carefully and respectfully developed. There's no sense here that Sussman is excusing offenders, rather, she explores, as with the consequences of crime, the consequences of disadvantage, peer pressure, and lack of hope. There are aspects of this novel that are a physical, not just a mental experience, searingly uncomfortable and yet, moving and affecting. In the end it does all come down to hope - you hope that Carla Reid will continue to move on. You hope that Ben Toroa will continue to understand his choices haven't been wise or necessary. Ultimately, THE LAST TIME WE SPOKE will leave readers thinking about consequences long after the novel has come to an end. Karen Chisholm is one of Australia's leading crime reviewers. She created Aust Crime Fiction in 2006, a terrific resource. Karen also reviews for Newtown Review of Books, and is a Judge of the Ned Kelly Awards in Australia and the Ngaio Marsh Award for Best Crime Novel. This review was first published on Aust Crime Fiction.